Victor Valladares can tell the time of day when he's at his apartment in Huntington Beach's Oak View barrio just by smelling the air. Slim, loud, wearing a Packers hat and sporting the names of his two boys on his tatted forearms, the 29-year-old is standing across the street from the stench's culprit: Rainbow Environmental Services, a 17-acre garbage facility that has exponentially expanded in its nearly 50 years despite facing an elementary school and preschool with more than 1,000 students and being downwind from Oak View, a neighborhood of more than 10,000 people where Valladares has lived his entire life. The two walk alongside Nichols Lane, the street that separates Rainbow from Oak View Elementary, which Clayton-Tarvin represents. On Rainbow's side, a company executive preps for a photo shoot, assistants shifting light reflectors to capture her best side. Its sidewalk is clean, its southbound section of Nichols smooth as a speedway. As if on cue, the 18-wheeler swerves to avoid all the ruts on Oak View's section. It joins a parade of idling garbage trucks, big rigs hauling containers of trash, pickups with payloads spilling trash–vehicles of almost every kind, really, all trash-filled–lining up to enter Rainbow, just a stone's throw from the preschool's jungle gym. 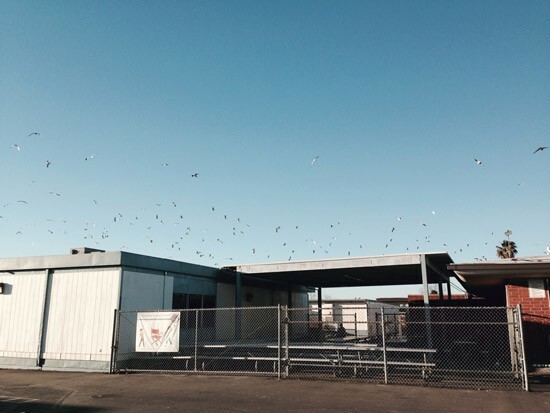 Above, a flock of seagulls circle intently, their bird droppings on Oak View Preschool's parking lot a testament to the feast that awaits them. The two stare at Rainbow a while, then walk back to the preschool–there's work to do. 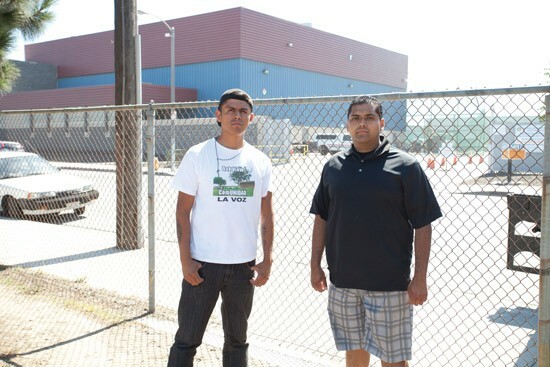 Valladares is part of a new generation of residents in Oak View–universally called the Slater Slums by the rest of Orange County–tired of serving as Huntington Beach's de facto dump. He and his friends are rallying neighbors to take on the reeking colossus to the west, a powerhouse that has dominated politics and civic life in Surf City for decades even as it has been dinged for multiple notices of violation. Clayton-Tarvin, meanwhile, is using her power as an elected official to launch legal actions against Rainbow, alleging its fumes are making Oak View's students, teachers and residents sick and demanding they do something about it. Critics call the two crazy, accuse the trustee of using Mexicans to further her political agenda, and say the young activists are useful pendejos to gabachos who want to upset the status quo. When Oak View Elementary opened its doors in 1967, Rainbow Disposal already stood kitty-corner across Nichols, on a plot just smaller than 2 acres. Founded a decade earlier, the firm hadn't yet turned into the giant it is today: one of the top 10 employers in the city and financial donor to five of the seven current Huntington Beach City Council members, three of five Huntington Beach Union High School District trustees, Assemblymembers Travis Allen and Matt Harper, and numerous Huntington Beach nonprofits. In 2014, Phoenix, Arizona-based Republic Services, one of the largest trash companies in the country, bought out Rainbow for $112 million in cash but allowed it to keep its name. Hand in hand, the Oak View neighborhood and Rainbow grew. In 1981, the company received a solid-waste-facility permit that allowed it to operate on 4.65 acres, open a recycling facility and have the capacity to process 800 tons of garbage per day. Conditions were placed to mitigate any odors because the heart of Oak View was less than half a mile away, and some apartments stood within 500 feet of Rainbow–but city documents don't mention protecting the children of Oak View Elementary. In response to the AQAR, the AQMD wrote it had received 78 odor and dust complaints against Rainbow from 2006 to 2008, leading to a notice of violation for “creating a public nuisance from odor.” And a Dec. 19, 2008, letter by the California Integrated Waste Management Board dinged the city's planning department for not consulting with school officials about the project's impact. Four years later, a different OVSD leadership wouldn't be as welcoming. With her blond hair; Jackie O sunglasses; and propensity for glittery fingernails, large necklaces and platform wooden heels, Clayton-Tarvin seems more Huntington Harbour housewife than rabble-rousing trustee. But there she is on a weekday morning, handing out free lunches to students in a grassy area of Oak View Preschool. A faint scent makes kids wrinkle their noses. “Someone call the AQMD,” Clayton-Tarvin says to no one in particular. “We don't want our kids to be smelling trash. They also maintain Clayton-Tarvin is using the shield of environmental justice to mask a bigger issue: OVSD is in financial trouble. 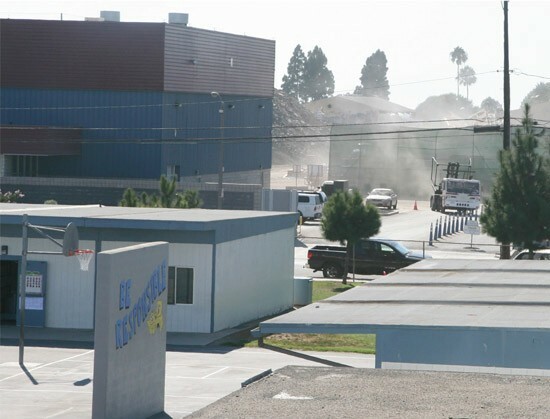 The 2014 discovery of asbestos in three schools–including Oak View Elementary–forced their temporary closure and the bussing of children to schools as far away as Buena Park. But in Oak View, she has a loyal fan base. “I love her,” says Roger Lara-Renteria. The 27-year-old first met Clayton-Tarvin during an argument in a parking lot. He had just led a walkout of parents from the Oak View Community Center during an OVSD community forum explaining the asbestos controversy. The lifelong Oak View resident accused her of being an uncaring politician; she challenged him to do something with his anger. Lara-Renteria helped organize a Cinco de Mayo rally called “Put a Lid On It!” at Oak View Elementary, which his sister attends, that drew hundreds of students and teachers. Clayton-Tarvin has lived in Huntington Beach since 1989, teaches for the sixth-grade GATE program in Cerritos and is the rep for her school's teachers' union. She ran for a seat on the OVSD board in 2012 at the urging of OVSD teachers. And as she took office, the San Diego native almost immediately walked into a showdown with Rainbow. In 2004, Rainbow had purchased 5 acres directly bordering Oak View Elementary known as Historic Wintersburg, site of a long-standing Japanese-American community. The company sat on the property until 2013, when Clayton-Tarvin discovered that Rainbow was going to ask the City Council to change the zoning on the parcel to commercial and industrial. Before then, Rainbow's relationship with Oak View was largely cordial, smell complaints aside. One year, students even got to see a show-and-tell on campus with a hawk hired to keep seagulls away. “I knew Rainbow was there next to Oak View, but I never knew how bad it was,” Clayton-Tarvin admits. The council voted 4-3 to side with Rainbow. In demurrers, Rainbow's legal team argued the writ should be tossed because, they claimed, the statue of limitations should've started in 1981, when Rainbow began processing trash. A judge rejected Rainbow's argument. Lawsuits in hand, Clayton-Tarvin began recruiting. Lara-Renteria was one of her first acolytes; next came Oscar Rodríguez, a premed student at Long Beach State, chief operations officer for the Oak View Youth Soccer League and another lifelong resident. Rodríguez, in turn, recruited Valladares to speak about Rainbow at a Huntington Beach City Council meeting in June. Only problem? He didn't have a ride. Together, the two decided to do more than just fight Rainbow. Valladares built homemade traffic cones to slow down speeding cars in front of his house; Rodríguez made late-night runs to Kinko's to make fliers promoting their Facebook page, OakViewComUNIDAD, a community forum on which people can post pictures, stories and updates about their barrio. The two say they got their inspiration from Johnny Kresimir of Johnny's Saloon, who blessed the idea with a round of beers on him. They are already getting results; Assemblyman Matt Harper blocked Rodríguez from viewing his Twitter account after Rodríguez asked how much money the former Huntington Beach council member had taken from Rainbow over the years (more than $9,000 from Rainbow and Republic in 2014 alone). Huntington Beach City Attorney Michael Gates is now in constant communication with the two. And on the legal front, the victories keep piling up. Earlier this year, a hearing officer ruled that the Orange County Health Care Agency ignored OVSD complaints about Rainbow when renewing its operating permit, calling it an “abuse of discretion”; the county is currently appealing. 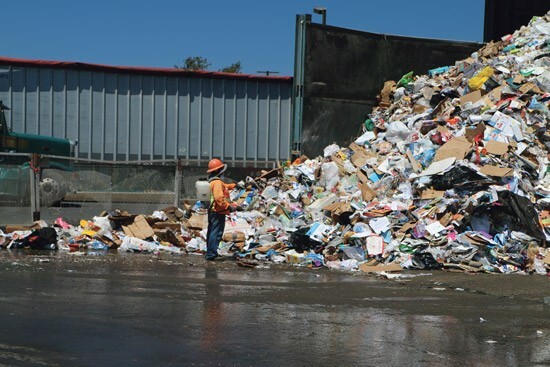 On June 22, an Orange County Superior Court judge told Huntington Beach to undo the Wintersburg property's industrial zoning and ensure it never be used by Rainbow for waste operations. 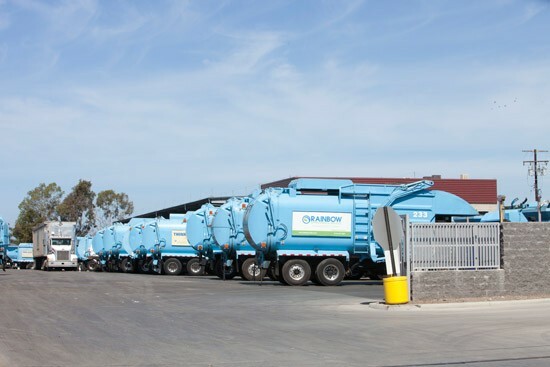 And the AQMD is sniffing around again: Since 2014, records show the regulatory board has issued six notices of violation against Rainbow; much more than any other trash hauler in Orange County. Logs indicate Rainbow has received more than 200 odor complaints since 2007. On July 6, dozens of people showed up to the Huntington Beach City Council chambers to protest the possible rezoning of Don the Beachcomber, the legendary tiki bar in Surfside. Rainbow recently announced it was building a full-enclosure facility to try to clamp down on odors. But that's not good enough for Clayton-Tarvin. She wants to make sure Rainbow installs biofilters and allows OVSD to have a say in any proposal Rainbow has for the Wintersburg site. And if Rainbow can pay all of the district's legal and attorney fees? Even better. Suddenly, a fetid blast makes an onlooker cough. Clayton-Tarvin doesn't flinch.